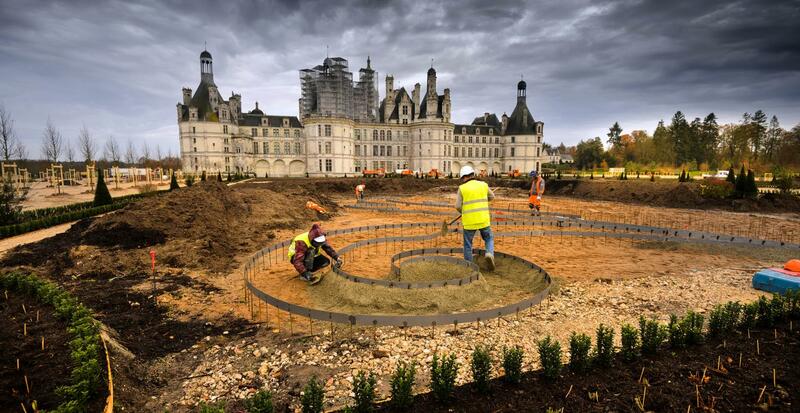 The chateau’s French formal gardens have been restored to their original 18th-century glory, thanks to a generous gift to the American friends of Chateau de Chambord at KBFUS. “Can you imagine, dear Paul, that ever since I saw Chambord, I have been asking anyone and everyone: Have you seen Chambord?” So goes a quote attributed to Victor Hugo, the famous 19th-century French poet, novelist and dramatist of the Romantic movement. Whether or not he actually spoke those exact words, there is no doubt that anyone today who visits the Chateau de Chambord in France’s Loire Valley would understand the sentiment. The chateau is the largest and one of the most beautiful castles in the Loire Valley. Its distinctive architecture blends traditional French medieval forms with classical Renaissance structures. Thanks to a 3.5 million Euro donation from Stephen Schwarzman, an American financier and philanthropist, its French formal gardens have been restored to their original 18th-century glory. They opened to the public at the end of March. Schwarzman, chairman and CEO of the Blackstone private equity firm, made his generous gift through the American friends of Chateau de Chambord at KBFUS. With its ‘American friends funds’, KBFUS provides European and African nonprofit organizations with a cost-effective solution to receive tax-deductible gifts from U.S. donors. Also a patron of the Louvre and the Musée des Arts décoratifs in Paris, Schwarzman decided to finance the garden restoration after visiting the chateau twice over the past few years. “National treasures like Chambord are of tremendous importance to the cultural heritage and history of France, the French people and the international community,” Schwarzman said. The construction of Chambord started in 1519, under the reign of King François I. The surrounding lands had abundant game, which allowed the king to indulge in his love of hunting. In 1682, Louis XIV drained the property’s swamp area and had two gardens designed, to the North and to the East. And in 1734, under Louis XV, the gardens were redeveloped and embellished with tree-lined alleys and groves. These formal gardens existed for more than two centuries but progressively disappeared between World War I and World War II. The French Republic acquired the estate in 1930 and has preserved the unity of the chateau, the surrounding forest and the 20 miles of walls around them, which together form the ‘Domaine national de Chambord’. The chateau was one of France’s first listed monuments and became a UNESCO World Heritage Site in 1981. Some of its surroundings are included in Natura 2000, a Europe-wide network of natural habitats and core breeding sites for rare or threatened species. The gardens are inseparable from that of Chambord’s famous façade, extending from the foot of the chateau. The foundational axis, structure and perspectives that governed the gardens in the 18th century are still present today. Most shots of the chateau include these spaces. The Great Perspective measures nearly three miles long. This major axis serves as a broad central walk. It passes directly through the chateau, in perfect alignment with the famous double helix staircase. Sweeping down to the forest, it helps showcase the majesty of the chateau and provides the public with a better perception of this extraordinary monument. Frédéric Bouilleux, Deputy Director General of the Domaine national de Chambord, says that planning for the restoration of the gardens started approximately 15 years ago. Researchers and government officials combed through archives housed in the county offices of Chambord and in national and local collections. They studied the original plans, drawings and engravings, to find out what types of flowers and trees were used. They even conducted a geophysical survey that confirmed within a few inches the location of various garden features. “This is the largest garden restoration project of our time. French garden design is a very formal, precise, and ordered gardening style, with many straight lines and symmetry. It is based on the principle of imposing order on nature. The American friends of Chateau de Chambord was set up at KBFUS in 2014, in an effort to raise funds from American donors for key projects at Chambord, including the renovation of the gardens. Several contributions were received over the next two years. And when Schwarzman confirmed his donation during the summer of 2016, the garden restoration project took off at lightning speed. Bouilleux credits KBFUS for getting the funds to Chambord in record time. “This is the largest garden restoration project of our time,” says Bouilleux. “It was an enormous undertaking. That’s why it was a little bit expensive,” he adds with a laugh. The restored gardens cover 16 acres at the foot of the chateau’s northern facade. They feature more than 600 trees, 800 shrubs, 200 rose bushes, 15,000 plants marking out the perimeters, and more than 4.7 acres of lawns. The maintenance of the gardens will be as environmentally friendly as possible. Those charged with caring for them will closely follow the instructions given to gardeners in 1749, which have been preserved.